The first of three Presidential debates between President Obama and Governor Mitt Romney takes place this Wednesday. This cartoon by Clay Bennett of the Chattanooga Times Free Press portrays the debate as a boxing match. Obama is waiting in the ring with the referee. Meanwhile, the challenger Romney is being carried into the ring by his Republican seconds (note the elephant logo on their backs). And are those drops of blood on the floor (which, in fact, looks like snow)? The cartoonist has reversed the clichéd image of the dazed and defeated boxer being helped from the ring by his seconds at the end of the fight. 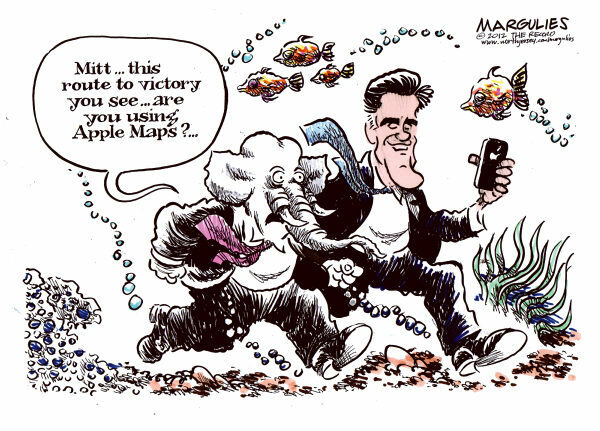 The suggestion is that Romney has suffered a metaphorical knockout before the debates even start, following a series of gaffes and missteps which have given Obama the advantage. In fact, the latest polls show Obama with a two-to-eight-point lead over Romney. The title of the cartoon is "The Main Event". The term occurs primarily with reference to combat sports such as boxing, professional wrestling and mixed martial arts. The main event, generally the most prestigious match on the card, has the most promotion behind it. The match commonly involves a contest for a top championship (source: Wikipedia). Chicken owners who are going on holiday can now rest easy in the knowledge that their hens will receive five-star treatment at a chicken hotel in England. Tara Cleary reports. REPORTER: Chickens are in charge at "Fowlty Towers" - so says owner, Julie Smith. She says the business evolved from a real need in her Kent community. JULIE SMITH: "A lot of people asked what they would do when they went on holiday with the hens, so I started looking after them as a favour and then I thought well it might be a bit of a business and we'll try and get them sorted." REPORTER: Smith's chicken hotel is five-feather poultry luxury. The girls enjoy fresh vegetables daily and some even get to go out for a treat. Smith, who has 13 hens of her own, says unless she's told otherwise, guest hens' eggs are kept until their owners' return. The chickens are housed in pens and they can also roam free in the fox-proof garden. JULIE SMITH: "Of course the best place for any animal including hens would be in their own home, that's what they're used to, but I try and offer them service where they get as good as home." REPORTER: And of course no cockerels are allowed into this girls-only spa … just cluck for service, dear! The name Fowlty Towers is a play on the famous TV comedy series Fawlty Towers (a fowl is a bird such as a duck or chicken). A sting is a clever secret plan by the police to catch criminals. • Police charged five women and two men following a Thursday night prostitution sting. A man and a woman are lost in the desert. The man is using Apple's Maps app to navigate and tells his companion that there should be a Genius Bar (i.e., Apple tech support station) right where they are. The Joy of Tech has a great cartoon on this topic. And this one by Jim Margulies adds a political slant. France unveils sharp tax hikes on businesses and the rich in a 2013 budget aimed at showing it has the fiscal rigour to remain at the core of the euro zone. Ciara Sutton reports. REPORTER: Hoping to safeguard the country's position at the core of the euro zone, France's 2013 budget is its toughest single belt-tightening in 30 years. But unlike Spain which slashed government spending, Prime Minister Jean-Marc Ayrault announced massive tax hikes on big businesses and wealthy households, to raise around 20 billion euros. FRENCH PRIME MINISTER JEAN-MARC AYRAULT: "This is a budget which also requires an effort. But it is a just effort. Income taxation will not impact the middle and working classes. Nine tax households out of ten, 90 percent of the French who pay income tax will not face higher taxation, assuming equal income. This is a guarantee that we give the French." REPORTER: But Justin Urquhart-Stewart of Seven Investment Management isn't convinced. MARKETING DIRECTOR AT SEVEN INVESTMENT MANAGEMENT, JUSTIN URQUHART-STEWART: "What you'll find is there will be more concern when they look at the broader package and the affect that's going to have on the French citizens, because remember only a few months ago promises were being given which are now being broken so this is going to go down very badly indeed." REPORTER: Socialist President Francois Hollande was elected on pledges to bring down unemployment. But it's now at a record high, with carmaker Peugeot expected to shed 8000 jobs, and drugmaker Sanofi cutting 900. The French economy is expected to grow by 0.8 percent with the country's deficit falling. Daragh Maher is FX Strategist at HSBC. DARAGH MAHER: "They seem to be making realistic projections, some unpopular decisions I would imagine domestically, and so there is going to be pain for France. But it feels like they are going to try and achieve those targets. But slippage of fiscal targets is something the market's got used to over the last few years, so if France were to slip a little bit I don't think it would be absolutely devastating." REPORTER: Markets fell on the announcement of the package and business leaders fear such steep tax hikes could mean an exodus of top talent. Ciara Sutton, Reuters. Joblessness is the condition of having no job. • French consumer confidence fell for a third month on concern that surging joblessness and President Francois Hollande’s plans to slash the budget deficit will hurt pocketbooks. This cartoon by Blower from The Daily Telegraph relates to UK Prime Minister David Cameron's appearance on CBS' Late Show With David Letterman. During the interview (which you can see in full here), Letterman asked Cameron a series of questions on British music and the Magna Carta. Although the PM managed to answer some questions correctly, he was unable to give a translation of Magna Carta (Latin for 'The Great Charter). 'You have found me out. That is bad, I have ended my career on your show tonight,' the prime minister said. Cameron is shown as a pupil at his old school, Eton College, writing lines under the stern supervision of a cane-wielding master as a punishment for not doing his Latin homework. Part of the joke is that Cameron is actually writing on a giant sheet of paper (Magna Carta). I've always thought that getting pupils to write lines as a punishment exercise is a particularly unimaginative (not to say ineffective) way to encourage better behaviour (maybe because I did so many when I was at school!). Mind you, it is very surprising that Cameron couldn't translate Magna Carta. You don't need to have done any Latin to have a good guess at that! Or perhaps he was just bluffing. Harry Potter author J.K Rowling has released her first novel for adults, ''The Casual Vacancy'', concerning life and class prejudice in a small English town. After the seven-book Potter series sold 450 million copies worldwide, booksellers and publishers are hoping her latest work sells well too. Joanna Partridge reports. REPORTER: Could this one novel give booksellers and publishers a boost? British bookshops opened early as "The Casual Vacancy" went on sale - the first book for adults by Harry Potter author J.K. Rowling. Rowling's name alone will attract readers - and the book's virtually guaranteed to top best-seller lists in Britain, the U.S and around the world. GRACE PROCTOR, J.K. ROWLING AND HARRY POTTER FAN: "I couldn't wait to have it in my hands and then I'll read it as soon as possible, maybe in my lunch break, maybe now, a bit before work, and try and read it as quick as possible, and then read it again like all the Harry Potter's." REPORTER: The record-breaking seven book and eight movie franchise about the boy wizard made Rowling what Forbes magazine called the world's "first billionaire author". Five years on her first foray into adult literature has attracted the sort of coverage that most writers can only dream of. Rowling did very limited publicity ahead of the launch of her story about life and class prejudice in a small English town. But that's not expected to dent sales says bookstore manager, Gary Powell. GARY POWELL, MANAGER OF FOYLES BOOKSHOP: "A lot of the market that read the Harry Potter books were adults anyway, so I think they're going to identify with her style of writing. It's going to be one of our key titles for Christmas, absolutely, and it's going to sell really well from now through until next year as well." REPORTER: The Harry Potter books changed the face of publishing - they sold 450 million worldwide. In the UK the series tops the list of recent best-sellers according to Nielsen Bookscan with over 31 million copies sold. That's followed by 10 million copies so far of the Fifity Shades trilogy by EL James. And then 5 and a quarter million copies of Dan Brown's "The Da Vinci Code". "The Casual Vacancy" reportedly saw pre-sale orders of 2.6 million. In the age of eReaders - it seems many book fans still want to get their hands on a hardback on publication day. Rowling herself has expressed a desire to avoid the "insanity" which surrounded Harry Potter publications, but booksellers hope this hype will also translate into sales. Joanna Partridge, Reuters. The book's list price in the UK is £20. We saw in the video that Foyles is selling it with £5 off. However, other outlets are offering much bigger discounts: Tesco and Amazon are selling the hardback for £9.00, while the Amazon Kindle edition will cost you £11.99 (see here for a discussion of this seemingly crazy pricing strategy). A portion is an amount of food that is given to one person at a meal. • To lose weight, you need to eat smaller portions. If you swap one thing for another, you give it to someone and receive a different thing in exchange. • Unwanted clothing, CDs, books and bric-a-brac can be swapped for wanted items at a Give and Take day. • Would you eat badger meat? • What's the most unusual thing you have ever eaten? • What things do you refuse to eat? • Where do you stand on the badger culling question? Angry Birds-maker Rovio Entertainment will be hoping to prove it's no one-hit wonder when it launches Bad Piggies, just as players seem to be tiring of the game they've been addicted to for the past three years. Matt Cowan reports. PETRI JARVILEHTO: "We've approached game play this time around from a very different angle. "Angry Birds" games are essentially like you're shooting birds with a sling shot and the way we see the birds destroy things whereas the pigs they are the builders. So this is a game that's completely based around the concept of the pigs building things - they see delicious eggs and start heading that way and start building all kinds of devices to reach their goal." REPORTER: The stakes are high for Rovio, which is eager to prove it can create hit games that do not have Angry Birds in the title. Jack Kent is a mobile analyst with IHS Screen Digest. JACK KENT: "I think it's very important for Rovio. Angry Birds has had over a billion downloads, but they followed it with Amazing Alex which had initial success, but it fizzled out very quickly. So it's really key for Rovio to prove it has success beyond the Angry Birds franchise." REPORTER: Rovio was founded in 2003, but it wasn't until 2009 that it came up with it's breakthrough success which has helped the company extend its business well beyond games. JACK KENT: "It's always important to remember that it had around 50 games released without very much success before Angry Birds and what Angry Birds did is it effectively rode the perfect storm of the smartphone and game explosion. Launched in 2009, it had great success in 2010, 2011, and still today. And with that Rovio has managed to expand its value into the billions of dollars now. It says it plans to be on a par with a company like Disney in terms of having cross-platform success." REPORTER: Rovio's revenues surpassed 100 million dollars in 2011 and some analysts place the company's value as high as 9 billion dollars. But will it's trajectory rise and fall with Angry Birds? PETRI JARVILEHTO: "What we have been doing with "Angry Birds" is we have been consistently building "Angry Birds" as a brand, much stronger than the game itself. We've been pushing, for us the big thing about Angry Birds is not necessarily the sling shot game, it's the characters, the universe, it is everything that we can create with those fantastic little birds or fantastic little pigs and that I think is a crucial difference in mind set in terms of how we've approached this." REPORTER: It's expected that Bad Piggies will reach number 1 in the App store after the game's launch on September 27, but the real test of success will be how long it stays near the top of the charts. Matt Cowan, Reuters. If you reverse something, such as a decision, judgment, or process, you change it so that it is the opposite of what it was before. • More changes are required to reverse the trend towards centralised power. This cartoon Dan Piraro, best known for his award-winning syndicated cartoon panel Bizarro, pokes fun at all the hype surrounding the launch of Apple's new iPhone 5 (which in reality does not boast any really revolutionary new features). Put your students into groups and get them to design the 'smartphone of the future' (or the iPhone 6). Give each group an OHP transparency (and a pen) and get them to present their ideas to the rest of the class on the OHP (if you've got one). Popular entertainment magazine Time Out is now being given away for nothing in London, one of a growing number of publications to decide that marketing their titles for free makes more economic sense. Andrew Potter reports. REPORTER: Hot off the press, with a key difference. REPORTER: Time Out is one of London's best known entertainment magazines. From Tuesday it's being given away. Editor Tim Arthur explains why. TIM ARTHUR, TIME OUT EDITOR-IN-CHIEF: "It's quite a simple thing, we take away the cover price and because our circulation goes from 50,000 to 305,000 you get this massive reach across town which means you're able to attract some advertisers that we haven't done before, we're able to bring in slightly more revenue through advertising and that's how we cover it as a business." REPORTER: Ahead of the launch Time Out's production team battled the clock. TIM ARTHUR: "Seven a half hours to finish the mag." REPORTER: The magazine has been completely redesigned to meet its new market. TIM ARTHUR, TIMEOUT EDITOR-IN-CHIEF: "The whole idea was that we just wanted to do something to hit people in the face really, just captured it in one quick hit." REPORTER: We'll it's no secret that Time Out's paid circulation has been failling. It sold 93,000 copies a week in 2006 but last year that figure had fallen to 54,000. Greg Miall has launched successful free publications in the UK and Europe and was brought onboard to help Time Out do the same. GREG MIALL, PROJECT DIRECTOR, TIME OUT: "One of the main tenets of the business model is that your circulation is more or less your print run so you reduce costs that way and then you focus very heavily on the advertising side. And you guarantee an audience. You're guaranteeing a very strong audience. So the circulation is flat and you know who you're getting the copies to. And they're very much ABC1 as we call it in the UK, white collar workers, and they're very attractive to advertisers." REPORTER: Each afternoon in London, stacks of Evening Standard newspapers are given away. After going free in 2009, the paper's circulation doubled to 600,000. Print media commentator Colin Morrison says an economic reality unthinkable a few years ago is making more and more sense. COLIN MORRISON, PRINT MEDIA COMMENTATOR: "Some newspaper publishers would clearly make more money ironically from sacrificing the cover price and the need to promote to readers, get a bigger audience, get more advertising that way, grow a stronger business. So there will be more of today's newspapers going free but also more magazines." REPORTER: That could make for a crowded market. But Time Out is confident the quality of its magazine will make the difference even if readers aren't paying anything for it. Andrew Potter, Reuters. A runaway is someone, especially a child, who leaves home withouth telling anyone or without permission. • A Florida man who admitted turning teenage runaways into prostitutes was sentenced to 30 years in prison after a victim said he stole her childhood.